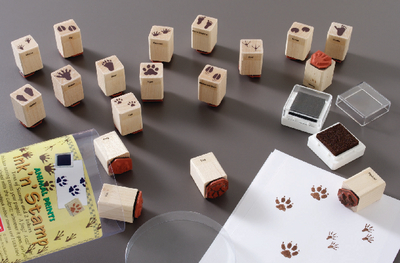 You can use the 18 different animal track stamps included in this set to make your own flashcards or use them anywhere you choose. Stamps include the pig, tree frog, fox, raccoon, dog, bear, rabbit, cat, tiger, human hand and foot, whitetail deer, gorilla, horse, squirrel, beaver, mouse, and bird (not to scale). The set also includes two ink pads.